2016 Infiniti QX30 - pricing revealed | What Car? 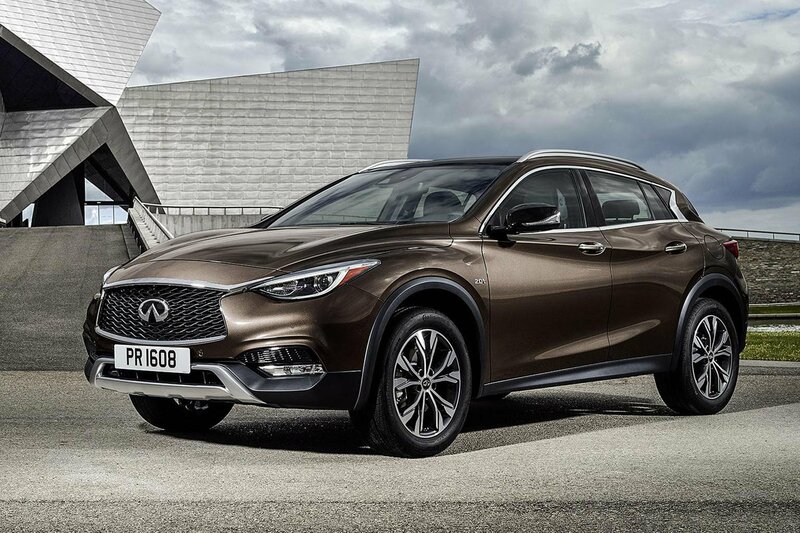 The all-new Infiniti QX30 has been revealed and will go on sale in the UK this summer. The Infiniti QX30 is the sister car to the recently launched Q30 hatchback. The QX30 was previewed with a thinly disguised concept car at the 2015 Geneva motor show, and the final product has stayed close to the concept's design. It features muscular bumpers at the front and rear, designed to give the QX30 an aggressive SUV stance. The QX30 will come with all-wheel drive as standard, and will likely be paired with engines already used in the Q30 range. At launch just only the 168bhp 2.2-litre diesel will be offered, paired with a seven-speed dual-clutch automatic gearbox. Infiniti has yet to reveal specification information for the QX30, but it's likely to echo the options found on the Q30. As a premium model, even entry-level versions of the QX30 are likely to come well equipped. The QX30 will also come with a range of safety technologies including adaptive cruise control, parking assistance and an Around View monitor, with most functions controlled via a 7.0in touchscreen infotainment system. Prices for the QX30 will start at £29,490 for a Premium spec model and rise to £33,370 for the QX30 Premium Tech. Just one engine will be available, a 2.2-litre diesel with all-wheel drive and a seven-speed dual clutch transmission. Infiniti is pitching the QX30 into the same premium crossover space already occupied by rivals including the Audi Q3, BMW X3 and Mercedes-Benz GLC, as well as big-selling SUVs such as the Nissan Qashqai. The Qashqai was named as the What Car? Car of the Year in 2014. The Mercedes-Benz GLC currently has a three-star rating on What Car? while the Audi Q3 has four stars. The BMW X3, meanwhile, holds a five-star rating.